The former Ford family home on Elk Track Court (photo courtesy of The Stockton Group). In the early 1980s, Colorado’s economy was languishing and the fledgling ski resort of Beaver Creek – just a few miles west of Vail – was in serious trouble. But the ski area first envisioned as a venue for the never-to-be 1976 Denver Winter Olympics, had one huge backer who never faltered in his support of the Vail Valley and the new resort that first opened with an inflatable tennis bubble as its base lodge: former President Gerald R. Ford. “Jerry,” as he preferred to be known in the Vail Valley, was one of the first homeowners to pick a lot at Beaver Creek – a resort that’s gone on to garner global recognition as a posh winter-sports playground of the wealthy and powerful. The 38th president of the United States chose to build on 65 Elk Track Court, right under the Strawberry Park Chairlift. The 11,629-square-foot home he built with his wife, Betty, has seven bedrooms, a home theater, game room and a private massage room in its main building and a separate ski-in, ski-out building to house the president’s private lap pool. It recently sold for $6.65 million. That may seem like a lot of money in the Denver Metro area, where it could buy four homes in upscale Cherry Hills Village at its median price of $1.5 million, but it’s exactly what the Fords sold the home for in pre-crash 2007 soon after the death of the former president at the age of 93 in December of 2006. And the California investor who bought the home from the Fords, Kevin Hayes, reportedly pumped $4 million into renovating the place – listing it for $14.5 million before the project was even finished in 2009. Described as somewhat of a Ford-a-phile because he was at West Point when Ford was commander in chief, Hayes played up the home’s history, marketing the fact that former presidents George H.W. Bush and Bill Clinton stayed there as guests of the Fords. However, Hayes found buyers – especially in the post-recession housing crash – weren’t all that wowed by a presidential seal in the entry hall or Ford’s ski jacket in the game room, which used to be used by the Secret Service to screen guests before they moved into the main house. The new owner, a Vail Valley local who wants to remain anonymous, purchased the home for what Hayes paid for it in 2007, using an Edwards, Colo.-based corporation called Monza LLC. According to the real estate broker who represented him, the new owner plans a massive remodel that will focus on the home’s ideal ski-in, ski-out location on one of the first lots developed in Beaver Creek, and it will in no way focus on the home’s quarter century as the mountain retreat of a former president. 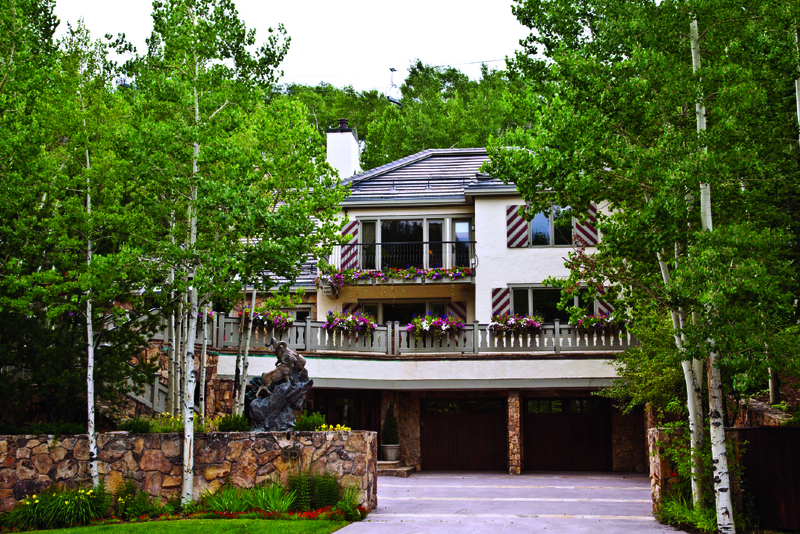 “President Ford’s vision, as far as being one of the pioneers of Beaver Creek and having the ability to pick anywhere he wanted to live — both resort-wise and homesite-wise –landed him on this street, and that says a lot,” said Tom Dunn of The Stockton Group, a division of Ascent Sotheby’s International Realty. The Stockton Group’s Tye Stockton, who represented Hayes in the deal, says it’s not at all surprising the new owner wants to remain anonymous and is downplaying the Ford name. “A lot of people who are drawn to Vail and Beaver Creek tend to want to fly under the radar screen more than, say, Aspen,” Stockton said. “Going forward, [the Ford legacy] is going to be understated. The new owner hopes to finish renovations and get the home back on the market by the end of the year, and both Stockton and Dunn say it could command a record-breaking price for a Beaver Creek remodel. Just don’t expect all of the presidential trappings. Ford never lived in his Beaver Creek home during his presidency, which started when Richard Nixon resigned in the midst of the Watergate scandal in 1974. The Republican was narrowly voted out of office in 1976 and replaced by Democrat Jimmy Carter. “I only lost by a handful of votes, figuratively speaking, so there were people then and maybe some today who never forgave me for pardoning President Nixon, but a president has to do what he believes to be right and not what is politically expedient,” Ford told the Vail Daily in his first interview after Nixon died in 1994. Carter, whose Carter Center nonprofit has met the last two summers in Vail, became friends with Ford after both men were out of the White House – and their friendship echoes that of Clinton and George W. Bush and a post-presidential spirit of bipartisanship. For many in the Vail Valley, though – regardless of their political persuasion — the Fords were simply ski-town neighbors you could run into at the movie theater, at a local restaurant or watch light the town Christmas tree every December.